Solar energy is captured as heat in your attic, harvesting this heat allows you to reduce heating costs. Attic heat harvesting systems were conceived and developed to make maximum use of this free solar energy. No other heating system can compete under any of these headings. A 1 floor home is shown, the Attic Heat Harvesting system can be fitted to multi-floor homes and to homes with basements where it is particularly effective. The chart above shows the relative cost of one unit of heat (kWh) from a number of different heating systems. Heat produced by the attic heat harvester system can reduce heating costs, it is typically more than 8 times less expensive than heat produced by a Natural Gas fuelled system, and 25 times less expensive than heat produced by an old oil fuelled system. Attic heat harvester systems can be supplied with an option to turn on an additional attic cooling fan when the attic temperature exceeds a user pre-settable value cooling the attic and reducing cooling costs. Many homes waste huge amounts of solar energy in the form of hot attic air, until now attics have not been thought of as a source of cheap heat. Reduce heating costs by using solar heated attic air as a heat source. You can achieve efficiencies of more than 2,000%, few conventional home heating systems can achieve even 100%. Attics can get quite hot even when the sky is cloudy, use this free solar energy and reduce heating costs. The system is automatically controlled by a custom designed Attic Heat Harvester Controller which also calculates system performance data. The Attic heat harvester system is generally a supplementary heating system, it partially replaces conventional heating systems and can reduce heating costs. There are however some areas in the world where attic heat can provide almost all the heat you need, the rest can usually be most effectively provided by electricity. The attic heat harvesting system can be very effective at heating areas that do not receive passive solar heat, for example, rooms on non sunny sides of homes and especially basements. 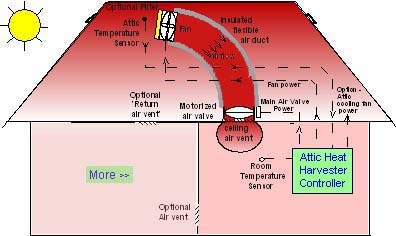 Attic heat harvester system effectiveness is dependant on the weather, the temperature difference between day and night, where your home is, the temperature of the room being heated, the type of attic and roof it has, the roof orientation, angle and openness to the sun's rays, and on the time of year. Unlike other more expensive roof mounted systems that use solar energy attic heat harvester systems use all the solar energy that the roof receives as it uses all the heated roof area. © Attic Heat Harvester Ltd. Company Number SC415547, based in Edinburgh, Scotland, UK.